The Brentwood Oaks youth ministry (The Rock Youth Ministry) exists to lead students to a faithful relationship with Jesus Christ. This means that we want students to study God’s word, learn about Jesus, choose to follow him, be baptized into Christ, and faithfully continue the journey. We also have things that we value as a ministry. Check those out below. You’re Loved. Live Like It. You are loved. You are valued. God has chosen you and paid the ultimate price for you. Don’t believe the lies of this world about your worth. God has sacrificed His own son so that He could be with you. If that’s the case, it changes EVERYTHING. It means that we live a life confident in who we were made to be. It means that we live like God’s got our back, because He does. It means that we live in response to His incredible love. You’re loved. Live like it. Scripture Guides. Let It Lead. We believe that God’s Word is the best way for us to learn more about God. We believe that it is His inspired word. If that’s the case, then we allow those words to become more than just words on a page, but a way to live our lives. Scripture teaches us how to be more like Jesus. It tells us about who He is, how to give our lives to Him through baptism, and how to live in a way that pleases Him. God has blessed each and every person with interesting and unique gifts. Ranging from very public to behind the scenes, all gifts have a place in the kingdom of God. God doesn’t just give us gifts for us to store away, but to use. We encourage students to discover those unique talents and find ways to glorify God with them. There are many different ways to serve at The Rock. Be an upfront leader and help with our worship times or lead a team on our mission trips. Lead behind the scenes by looking for those who need encouragement and pursuing them. 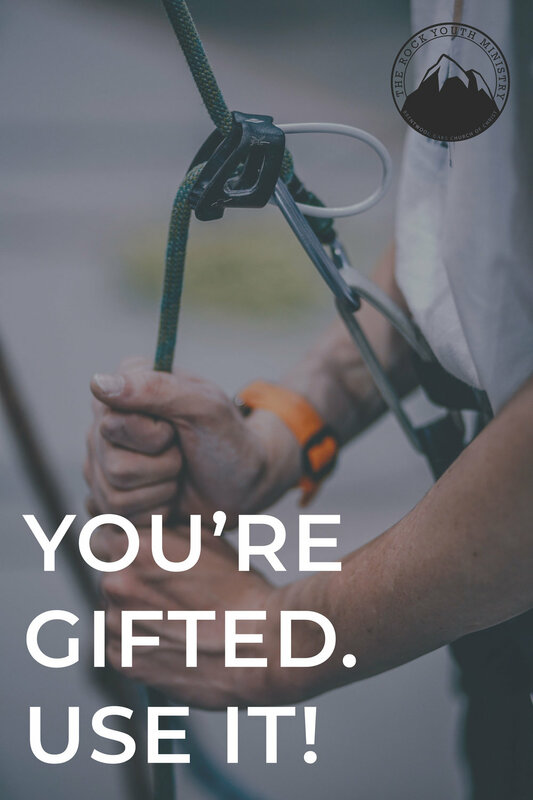 Whatever your gift, find a way to use it! As followers of Jesus, we are called to be different. Paul calls us to “shine like stars” among all people (Philippians 2:15) and to be “spectacles” (1 Corinthians 4:9). We aren’t called to blend into the background, but to make a statement. That can be quite a daunting task. Fortunately, we aren’t called to do this alone. We stand out in community with each other. We support one another as we shine brightly for Christ. Community at The Rock reminds us that we aren’t alone in working out our faith, and that we can stand out while we stand together. God continues to bless His people. It keeps stacking up. When we look at all the things He has done for us, we can’t help but be joyful! God is too good for us to live a bland and boring life. At The Rock, we try to “be joyful always” (1 Thessalonians 5:16). This comes out in all aspects of our life, both in the church and out of it. We are joyful in worship, in learning, in hardships, and in triumphs. God has given us too much for us to not be joyful!